Fixed Indexed Annuities : Safety and opportunity on the same dollar at the same time. Are you aware of the unique product called “Fixed Indexed Annuities,” which can help you achieve safety and growth on the same dollar at the same time? Through innovative financial tools, you can make sure your nest egg is kept safe from market declines. We’ve found there is more to be gained showing someone how to avoid the losses than trying to pick the winners! As you look ahead at the likelihood of increasing volatility in the market, it is important that you preserve your nest egg; it is the engine that drives your retirement future, from negative volatility. The catch? Most indexed products are designed for long-term or nest egg money. Dollars that need to be spent in the near term are best placed elsewhere. For those who have the luxury of time, indexed vehicles like Fixed Indexed Annuities* and Indexed Universal Life Insurance** have the possibility to outperform the market over time without subjecting principal to market risk and market volatility. Fixed Indexed Annuities* and Indexed Universal Life Insurance** are regulated by governmental agencies. These well-designed vehicles have many positives and two potential negatives. The first negative is that they don’t capture all the up of the market and the second is that they are initially not 100% liquid. These plans have surrender penalties that eventually expire, resulting in the policy becoming 100% liquid. Paying a surrender penalty is a conscious decision…Market loss is not. We offer a variety of plans ranging from 5 to 16 years in length offered by many different Insurance Companies. *Equity Indexed Annuities (EIA, also known as Fixed Index Annuities – FIA) are tax deferred products; they are not tax free. When withdraws are made from an EIA – the portion of the withdrawal that is not principal will be taxed at applicable income tax rates. Premature distributions (before age 59 1/2) may be subject to an IRS penalty of 10%, in addition to applicable income taxes. If receiving a bonus with an EIA purchase, you may incur higher surrender charges and be subject to a longer surrender period. Tax-qualified assets (e.g. IRA or Roth IRA assets) in EIA’s may not be eligible for additional tax benefits. Investors should have adequate resources to cover liquidity needs. EIA’s are not: a deposit of any bank; FDIC insured; insured by any federal government agency; or guaranteed by any bank or savings association. Riders and guarantees may be available at additional cost and may not be available in all States. Guarantees are based on the claims paying ability of the issuing company. **Indexed Universal Life (IUL) policies are tax deferred products; they are not tax free. When withdraws are made from an IUL – the portion of the withdrawal that is not principal will be taxed at applicable income tax rates. Premature distributions (before age 59 1/2) may be subject to an IRS penalty of 10%, in addition to applicable income taxes. Investors should have adequate resources to cover liquidity needs. IUL policies are not: a deposit of any bank; FDIC insured; insured by any federal government agency; or guaranteed by any bank or savings association. Riders and guarantees may be available at additional cost and may not be available in all States. Market linked returns are not guaranteed. The principal may be worth more or less than the original amount invested when the policy is surrendered. Death benefit guarantees are based on the claims paying ability of the issuing company. 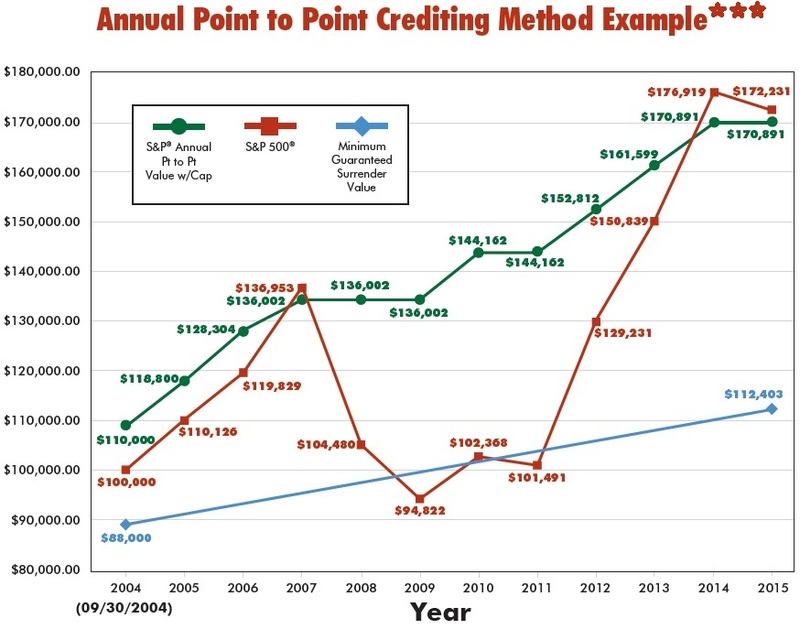 ***This graph is a HYPOTHETICAL EXAMPLE based on actual credited rates for the period shown. The $110,000 beginning value of this product includes a 10% premium bonus. Product and availability may vary by state. Past Performance is not an indication of future results.